109.7 metres long, perpendicular to perpendicular, 360.0 ft., speed of ? knots. Built for 'The Clan Line of Steamers Limited' ('Clan'), of Glasgow. But per Miramar, for Sir Charles W. Cayzer, of Glasgow. Miramar also indicate that in 1913 the vessel was registered to 'The Clan Line of Steamers Limited' ('Clan'), also of Glasgow. Now Clan had, I understand, become 'Cayzer, Irvine & Company, Limited' in 1907. 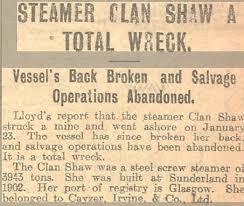 So I believe that the vessel would have been registered to 'Cayzer, Irvine & Company, Limited', when transferred in 1913. It is likely that the vessel was requisitioned by the British Government for service during WW1. What we do know is that in early 1917, Clan Shaw, defensively armed, was returning from Chittagong & Calcutta to Dundee via London, with a cargo of jute. On Jan. 22, 1917, UC-29, Oberleutnant zur See Ernst Rosenow in command, laid mines in the Firth of Tay & on the next day, i.e. on Jan. 23, 1917, Clan Shaw hit one of those mines. At 56.27N/02.38W, 8 miles NE of St. Andrews. Two lives were lost. SS Clan Shaw, after voyaging from Calcutta, was probably only an hour or so of docking in Dundee, subject to the tide, when it sunk at the mouth of the river Tay after striking a mine as reported in the Dundee Evening Telegraph of 31 January 1917. The two crew who died were Lascar Sulaiman Sharaf Ali, and Topass Maula Bakhsh Sadruddin, both of the Indian Merchant Service and both are commemorated at the Bombay 1914-1918 Memorial at Mumbai. The opening paragraphs of a much longer article in the Dundee Courier of 10 March 1919 of damage caused by the SS Clan Shaw wreck is highlighted and in the following day’s edition, it was mentioned that the wreck lay in quicksand making it very difficult to salvage. The St. Andrews Citizen of 05 April 1919 reported that “jute from the sunk Clan Shaw at the mouth of the Tay is giving the fishermen great deal trouble. Their nets get covered with the fibre, and it is a difficult matter cleaning them. The bed of the Bay is covered with jute, and the fishermen are of opinion that this is causing the fish to migrate to other parts of the coast”. Several newspaper accounts referred to the ongoing dispute between the Harbour Authorities and the Admiralty as to responsibility for clearing the wreck, during which time the SS City of Naples and the SS Circassia, both voyaging from Calcutta to Dundee were damaged when passing the wreck in the reduced width of channel. The City of Naples was holed and beached at Buddon Ness, eventually salvaged by early July. 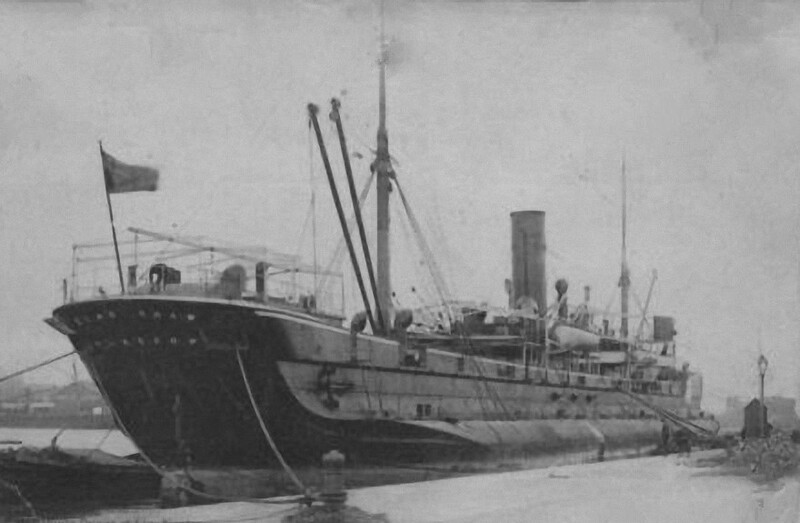 The Dundee Courier of 23 April 1919 reported that the Admiralty’s HMS Hearty, originally built in Dundee by Gourlay Bros. Ltd, had also struck the Clan Shaw wreck suffering damage. Dundee officials met with Mr Churchill in the government on 14 May 1919 to highlight the ongoing problems caused by the Clan Shaw wreck, as reported in the Dundee Evening Telegraph of 14 May 1919. This led to a Government offer to defray some of the cost of removal but the Dundee Harbour Trustees rejected the offer as insufficient. 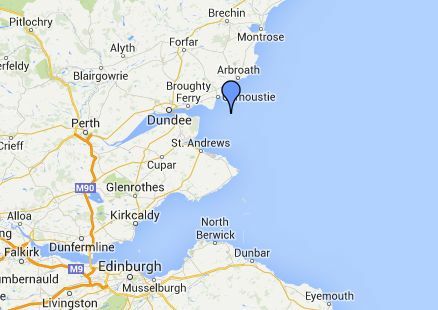 Ongoing wrangling did nothing to resolve the matter and the Dundee Courier of 10 October 1919 reported that another vessel, the SS Glentaise, had suffered damage from striking the Clan Shaw wreck. The Dundee Evening Telegraph of 22 October 1919 reported that the Dundee Harbour Trustees had eventually accepted a salvage offer of £7,500 (approx. £370k in 2018) to remove the wreck such that there was no more than 1m of the wreck above the seabed. 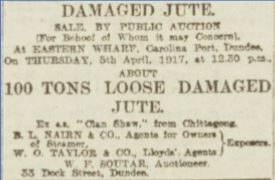 The Dundee Courier of 06 April 1917 carried this advertisement of the sale of damaged jute recovered from the Clan Shaw.